«I hear America singing…and I don’t like the tune. Oscar Peterson has died. There will be numerous obituaries in the coming days,lauding a “jazz giant,”“one of the greatest jazz pianists of the 20th Century,”or even “the best damn jazz pianist in the whole world,”and while all these tributes will be well-placed,they don’t sum up the loss I’m feeling tonight. 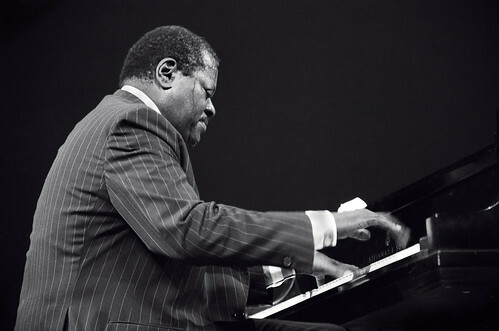 For me,Oscar Peterson is (not was –his recordings live on) the jazz piano. I don’t know for certain what the first jazz record I ever heard was,but if I was pressed to guess,it would have been Oscar,heavily favored,with the Modern Jazz Quartet or a Stan Kenton as distant,dark horse alternatives. Though I’ve grown to love jazz and jazz piano beyond Oscar,for me he’s the touchstone,the Ark of the Covenant,something that I can always count on,the tower at the center of my ever-widening circular exploration of some of the greatest music ever recorded. No slight is intended to Art Tatum,Fats Waller,Jelly Roll Morton,Mary Lou Williams,Duke Ellington,Thelonious Monk,Dave Brubeck,George Shearing,Bud Powell,or Horace Silver,but the small world that is my outlook on jazz will always be framed by Oscar and his piano. In particular,Oscar’s album Night Train spoke to my soul in some fundamental way at a crucial point in my musical development,and if it wasn’t for him,I might never have begun my love affair with the greatest musical form of the modern age. I also owe my love of jazz to my step-dad,who,though he banned rock and roll from the house,was more than willing to share with me his knowledge of jazz,both as a brass instrumentalist and a life-long concert-goer. Kevin’s enthusiasm for Oscar’s work sparked my own interest well over a decade ago. Our relationship had always been a little strained,a little uncomfortable when I was a kid,and Oscar’s music was the first bridge between us. Nights spent in the living room listening to Oscar really brought Kevin and I closer,something I’ll always be thankful for. Kevin’s seen Oscar a few times in his life,probably at least once in each decade of the Seventies,Eighties,and Oscar’s post-stroke Nineties revival. I have never seen Oscar live,nor will I ever have the opportunity now. No matter how long I live,this will be one of my greatest regrets. Farewell,Oscar. You helped me build two relationships I’ll have for the rest of my life,and so your contribution to my family is never forgotten,I’ll try to build these same relationships with my children.